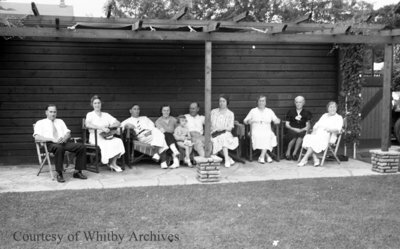 Black and white negative of family members of Mary Esther Cormack (nee Pringle) and Harriet Wilson (nee Pringle) sitting under a pergola at the 75th birthday party for the sisters. Harriet and Mary Esther Pringle were twin daughters of James Pringle, a Whitby hotel keeper, and his wife, Mary Corbett. The twins were born 23 July 1863 in the National Hotel at the north-east corner of Brock and Water Streets at Port Whitby. The Pringle twins were the first children to be baptized in St. Andrew's Presbyterian Church which opened in November 1859. In 1955 Harriet became Whitby's Centennial Queen being, at the age of 92, the town's oldest native resident. Mary died at Whitby 31 May 1950 and Harriet died at Whitby 17 June 1957. The John Pringle family came to Canada from Edinburgh, Scotland in 1833. In 1836 the family relocated to Whitby from Cobourg. 75th Birthday for Harriet and Mary Esther Pringle, July 30, 1938, Marjorie Ruddy. Whitby Archives A2013_040_758B.